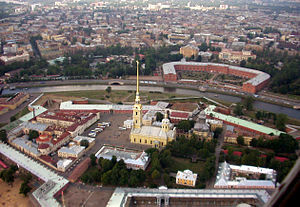 This fortress was originally meant to function as the city center, on the north side of the river Neva. It is located on a place called Hare’s Island. It was built in 1723. The Cathedral was named for its patron saints, Peter and Paul. The Cathedral (spire) was the tallest building in the city until the 20th century. It was also the first stone church here in Petersburg. It became the burial place of all Russian tsars, czars, and their families from Peter’s day until the end of the Romanov empire. The remains of Tsar Nicholas II and is family were moved here in 1997 from the Siberian city of Yekaterinburg. They were, as you remember, executed by the Bolsheviks in 1918. They are now honored with a Church of the Spilled Blood, both here in Peter, and in Yekat. Unfortunately, political prisoners were also kept here in the Trubetskoi Bastion. They include Peter the Great’s son Alexei, famous author Fyodor Dostoyevsky, Leon Trotsky, and Vladimir Lenin’s brother. Contrary to popular belief, John Lennon was not related to Vladimir!!! For tourists like me, the highlight is a noon cannon blast. I can’t wait! Just kidding. But now, in summer, the sand bar to the Neva side of the island hosts a sand sculpture competition. In winter, fisherman are allowed to camp out on the shored. And of course, the crazies dip into the Neva River, hoping the icy water will cure what ails them. Peter actually lived here in a small home, while St. Petersburg was built. NOTE: Either the wi-fi or my computer does not seem to like Peter. So, if you see some strange Russian letters, it must be the ghost of Peter the Great, with his not so great internet connections. ← OK, OK! On to St. Petersburg!